iTunes is troublesome to all of us and we generally know iTunes causes an infinite of troubles to iPhone and iPad, like iTunes not recognizing iPhone, iTunes isn't responding after plugging in an iPad, iTunes freezes when syncing files to iPhone iPad, etc. Yet, that's not the whole story. Actually, most products in Apple ecosystem has suffered from iTunes torment, the low-profile iPod included, as well. If you have an iPod, there are about 80% chance for you to encounter varied iTunes errors. Among them, the issue "iTunes won't recognize iPod" annoys iPod users most. 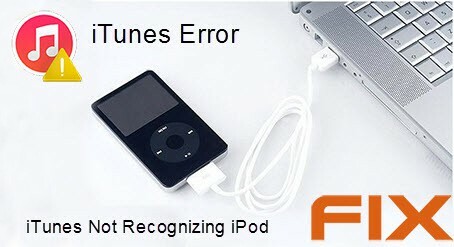 When you wanna connect iPod to iTunes to manage iPod files, your iPod is not connecting to iTunes; when you plan to sync music from iTunes to iPod, iTunes doesn't recognize iPod; when you are disposed to use iTunes to restore backup to iPHone, iPad, iPod, your iPod isn't detected by iTunes. You might have already tried some iTunes tips and tricks to fix iTunes not recognizing iPod problem, but this iTunes error happens now and then, not completely solved. No biggie! Here in this post, we'd glad to share with you the thorough solutions to completely fix iPod not recognized by iTunes problem. iTunes Won't Recognize Your iPod? Try iTunes Alternative! iTunes never stop annoying you. Goodbye to the troublesome iTunes. Try better iPod manager - MacX MediaTrans to sync and backup iPod files, incl. music, video, photos, iTunes movies, ringtones, ebooks, etc on Mac/PC and even edit/delete data on iPhone iPad without any crash or freezes, stable as Tim Duncan (Stone Buddha). Everything happens for a reason. The same is to iPod not showing up in iTunes. Providing you are a new hand in this area, you'd better skip the reason analysis part and go directly to the below solutions to try one by one. In case you know a thing or two about this iTunes not working issue, you can pick up the solution you need and pass the irrelevant solutions to save time and energy. 1. Check if the iTunes installed on your computer is the latest version. If not, update to the latest version first. 2. Check if you have the latest software installed on your macOS or Windows PC. 3. Make sure the power source on your iPod device is turned on. 4. A pop-up message asks you "Trust this computer? ", choose "Trust". If the same message appears again, you might need to restore "Lockdown" folder. 5. Pull out other USB cables off your PC and try to connect iPod to PC with other USB ports. Or use another USB cable to connect iPod to PC. 6. Restart your computer, as well as your iPod. 7. Try another computer to have a try. If your computer is not to blame, contact Apple Support. After you try the above iTunes tips but still can't get iPod to connect to iTunes, you're suggested to apply the following solutions based on your different operating system. Here we get it started with Mac computer. 1. Hold down on "Option" button and press Apple menu. Later, choose "System Information" or "System Report". 2. Click "USB" from the left-hand list. 3. Uninstall the third party security software if you see your iPod under the USB tree. If iPod is not showing up, contact Apple Support please. Of course, you can seek for help from Apple Support when trapped with iPhone not syncing with iTunes, can't restore iPhone from iTunes backup, etc. On Windows, follow the below solutions based on your Windows operating system. We begin with Windows 10. 1. Enter "Device Manager" to the search box on the lower left corner of the desktop. Then press "Enter". 2. Find "Apple Mobile Device USB Driver" from the list of Universal Serial Bus Controllers. 1. Slightly move mouse from the right side to center place in the desktop to switch the interface. 2. Tap "Search" and enter "Device Manager". 3. Click "Device Manager" and enter the password when prompted. 4. 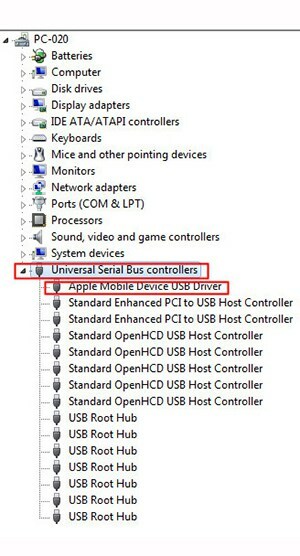 Find "Apple Mobile Device USB Driver" from the list of Universal Serial Bus Controllers. 1. Access to control panel > System and Maintenance > Device Manger. 2. Enter password and look for "Apple Mobile Device USB Driver" from the list of Universal Serial Bus Controllers. These are the solutions to fix iTunes not recognizing iPod on Windows computer by checking Apple Mobile Device USB Driver installation. Yet, there are also some problems happened on your Apple Mobile Device USB Driver. The symptoms are different. They need the specific solutions to cope with different cases. Below lists out the most common cases and the corresponding solutions. Just follow the instructions to go step by step. After you open Device Manger and find no any symbols beside the Apple Mobile Device USB Driver, please check if there are some conflicts caused by the third party apps, especially the anti-virus program. If so, close anti-virus application and firewall. 1. Disconnect your iPod to computer. 2. Press the home button and sleep/wake button at the same time to save a screenshot. 3. Re-connect your iPod to computer. 4. Unfold one of the following options if you see them in the Device Manager: Image Device/Other Devices/Portable Device/Universal Serial Bus Controllers. 5. Search the item that recognizes device as Camera and right click on this device item to manually update Apple Mobile Device USB Driver. 1. Right click on "Unknown Device". 2. Choose "Property" from the shortcut menu and then click Detailed Information. 3. Opt for "Hardware ID" from the scroll-down menu. If No, go to Device Manager, right-click "Unknown Device" and manually update Apple Mobile Device USB Driver. If Yes, disconnect iPod to computer and pull out all USB devices > Shut down your PC and restart it. > Re-connect iPod to PC. Test every USB port for 30 seconds to see if iPod can be recognized by iTunes. > Manually update Apple Mobile Device USB Driver. 1. 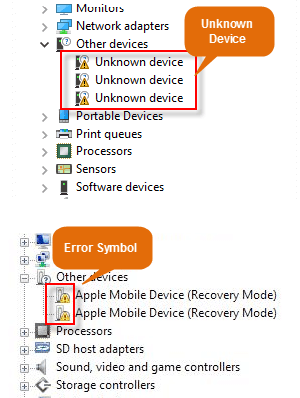 Restart the Apple Mobile Device Service if you see the error symbol with a caution, down arrow or question mark icon. 2. Check whether your third-party security software intercepts the USB driver. If yes, reset your 3rd party software to remove conflict. Afterwards, restart your computer. 3. Try to install the usbaapl64.inf or usbaapl.inf file again. You connect your iPod to iTunes mainly for files management, file sync or file restoration. Actually, these features are not exclusive to iTunes. You don't have to stick to the troublesome iTunes even when iTunes won't recognize iPod after several times trails. There are also other iPod manager in the current market capable of doing the same things even better than iTunes. MacX MediaTrans is one of them. This iTunes alternative can make iPod management, file transfer and data restoration simple and pain free. Just 3 clicks, you can transfer music, photos, video, iTunes purchases, ringtones, eBooks, etc. from iPod to computer for backup or vice versa. Plus, this iPod manager also allows you to create music playlist, edit music information, delete songs/ringtones/video/photos, make ringtones, mount iPod iPhone as USB flash drive, convert M4V to MP4, change M4P to MP3, etc. Step 2：Connect iPod to your computer via USB cable. Afterwards, an alert will tell you to adjust iTunes settings to prevent data erasing. 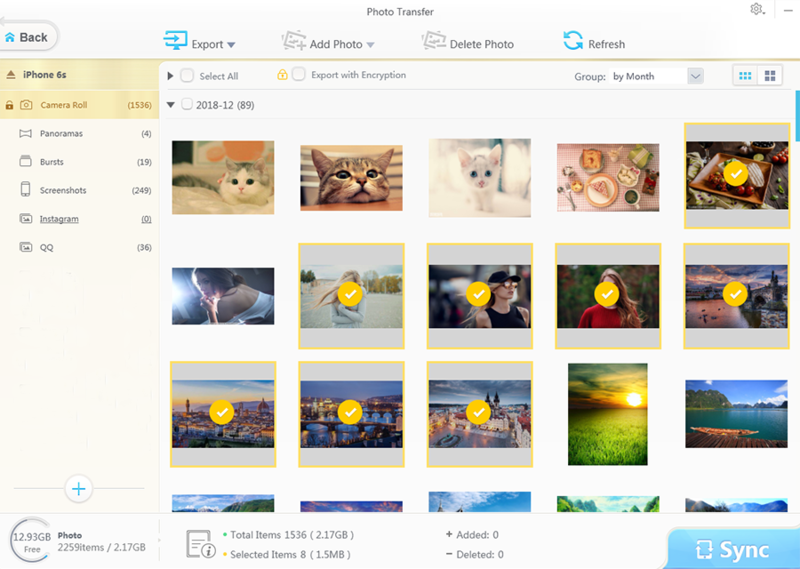 Step 3: Click the Photo Transfer on the main interface to enable photo sync feature, which enables you to add photos to iPod, import iPod photos to Mac and delete iPod photos. To backup iPod photos, select the photos and tap the Export option. Then it will begin to transfer photos from iPod to computer. It is tested that 100 4K iPhone pictures can be transferred within 8 seconds only. Free download the world's fastest and easy-to-use iOS iPod manager to easily recognize iPod and transfer files between iPod iPad iPhone and computer, including photos, videos, music, voicemail, books, movies, ringtones, audio and many more without iTunes not recognizing iPod iPhone error.